ICAMS group leader Fathollah Varnik has been appointed Apl. Professor by the faculty of Mechanical Engineering at Ruhr-Universität Bochum. Professor Varnik's research focuses on the theory and simulation of complex fluids. He has published more than 70 articles in renowned scientific journals. Since 2008 Fathollah Varnik leads the research group Theory and Simulation of Complex Fluids at ICAMS and his teaching activities cover statistical physics and the lattice Boltzmann method, among other fields. The Dean of the Faculty of Mechanical Engineering, Prof. Dr.-Ing. 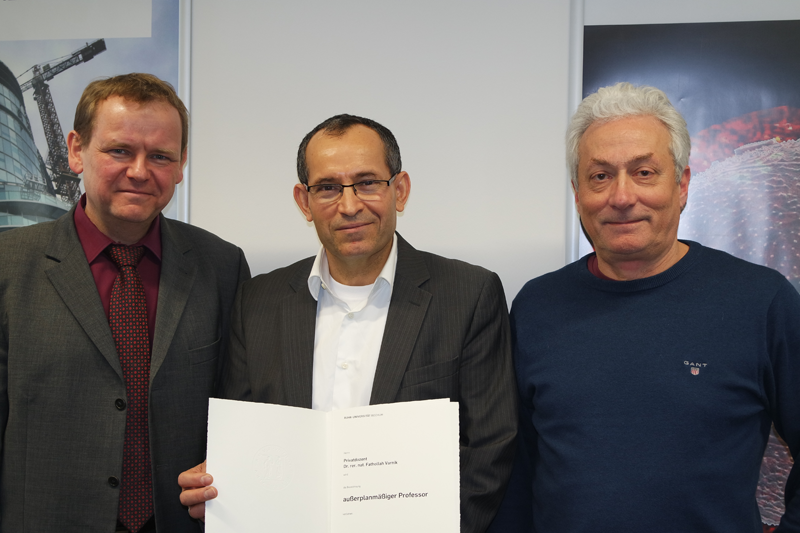 Roland Span, with Prof. Dr. Fathollah Varnik (middle) and Prof. Dr. Ingo Steinbach.